The future. It’s not as bright as you would have imagined it, but you’ve given up on pipe dreams. The world is what it is, and there’s no changing that. So you might as well be the one at the helm. You’ve got a henchman who’s sympathetic to your cause, with more waiting in the wings. Can you demonstrate your authority such that an army of underlings will hoist you onto their shoulders? 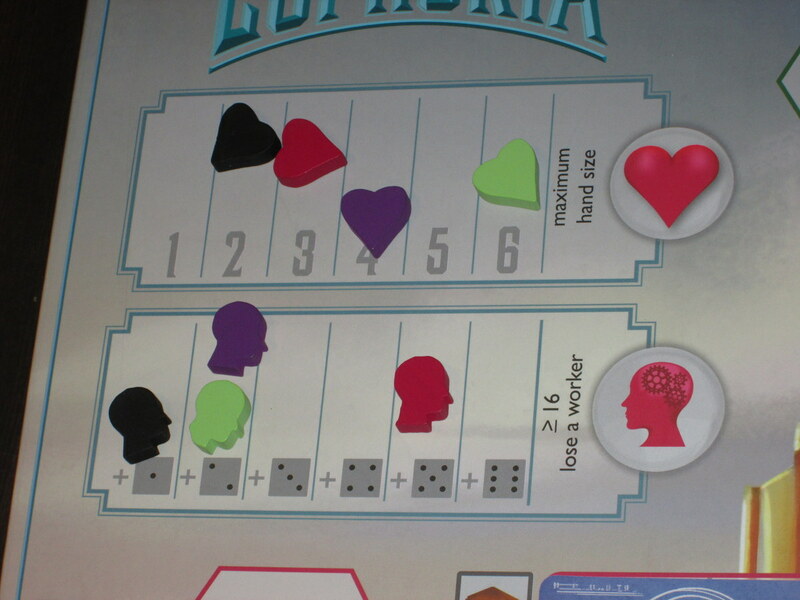 Euphoria is a worker-placement resource-management game for 2-6 players. Players are would-be despots in a dystopia, seeking to gain influence in order to take over the society. The first player to place ten influence is the winner. The board setup for four players. It’s a little busy. The board is set up by placing resources and commodities in their respective areas, and six markets are drawn from the market stack and placed face-down on their spaces on the board. Each player begins the game by drawing four recruits from the recruit deck. The player will keep two of these, choosing one to be an active recruit (provides its benefit immediately) and one to be a hidden recruit (potentially revealed for its benefit later). Players also receive ten authority stars and two of the dice of one color. Each player receives an ethical dilemma card, which can be executed once per game. Players place their knowledge indicator on the +3 space of the knowledge track and their morale indicator on the 1 space of the morale track. Players roll their dice to determine their workers’ starting knowledge, and the player with the highest roll goes first. On a turn, players must either 1) place a worker on the board, 2) remove one or more workers from the board, or 3) once per game, execute their ethical dilemma card. Players can work together to gather more resources in the resource area. The dynamics here are one advantage to having dice represent workers. Some placement spots on the board have an arrow next to them, denoting that someone may place another worker on that spot, thus “bumping” the worker who was there back to its owner’s supply. Other placement spots have a solid outline, and the only way to retrieve those workers is to use a turn to retrieve them. Whenever players get workers back into their supplies (either by retrieving, being bumped, or by some other means), they roll those workers. The player who rolled adds the value of all unplaced workers and the knowledge track modifier. If this total exceeds 16, one of the workers is returned to the supply. If a player begins a turn with two or more workers of the same value, he or she may place all matching workers in a single turn. The knowledge and morale tracks. The morale track determines artifact hand size. The knowledge track is the modifier you must add to determine if your workers know too much and run away. Players may also contribute to building markets, which act as a special means to place authority. Markets are only built once a threshold of contributing workers is reached, and each contributor places a star on the completed market. Completed markets offer a new conversion of resources into authority; they also impose a penalty on non-contributing players. 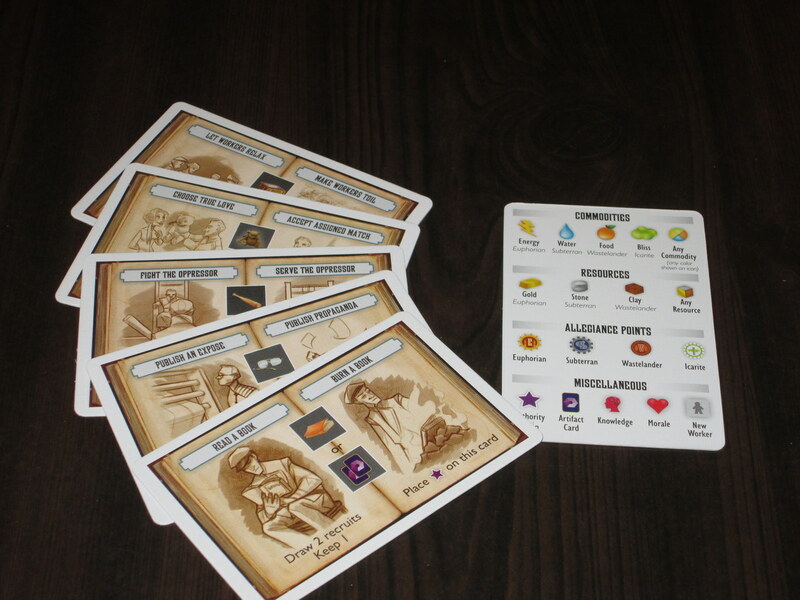 Players gain commodities, resources, and artifacts to convert into authority, allowing them to place their stars on the board. The first player to place all ten stars is the winner. Territories are one place where players can place their authority tokens. Brave New World, or Waterworld? Euphoria is a beautiful game, to begin with. I was an enthusiastic first-day backer of the game on Kickstarter, partly because I think Stonemaier Games is a great company that treats its backers right, and partly because the game and theme just looked awesome. I work with books as my day job, and Euphoria from the beginning attracted me by its provenance in dystopian literature. Now that I’ve run the components through my fingers again and again and played several times, I’m convinced that Euphoria is a decent game, but I don’t think it’s a great one. Which is a shame, because I think it could be with some streamlining. In case you were wondering, no, these custom dice are not Kickstarter exclusive. 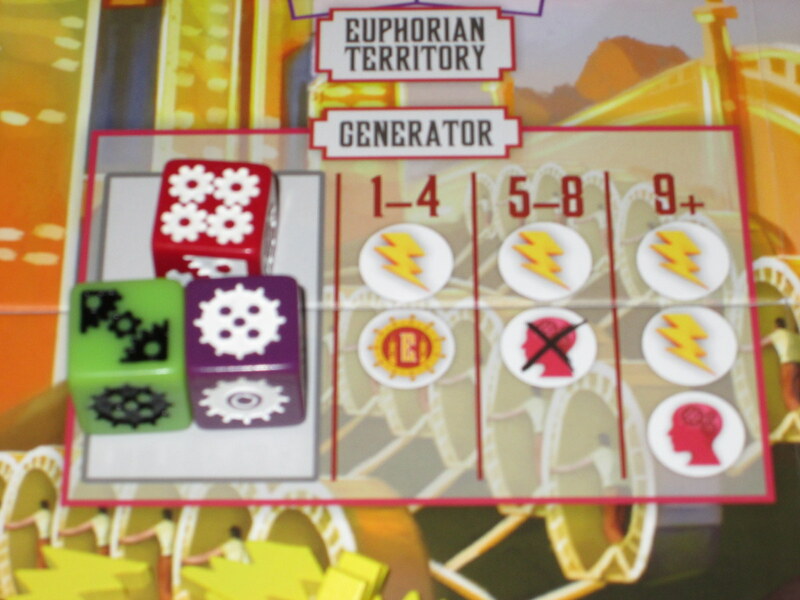 Euphoria is a worker placement game, but the workers are dice. There are some neat ways that the dynamic properties of dice are integrated into the game. 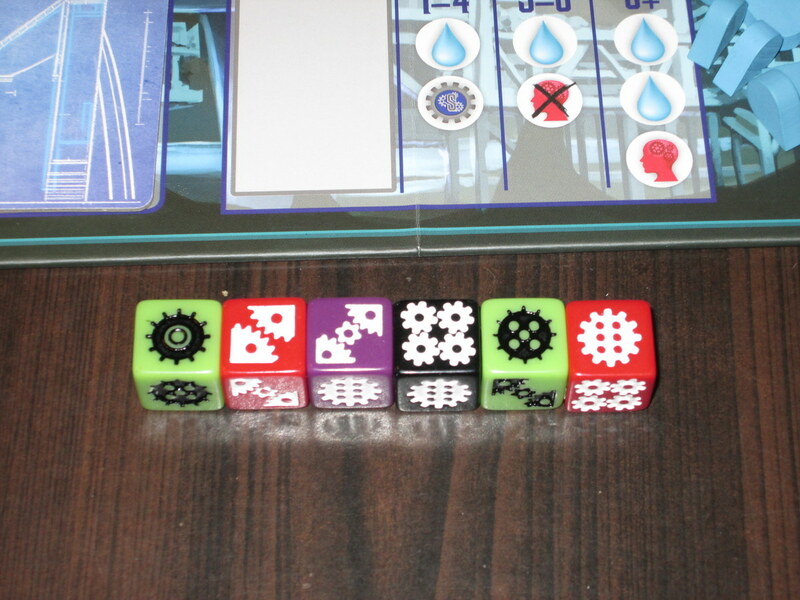 For example, each player has a pool of dice from which they can place workers, but whenever a worker is retrieved from the board, they must roll the die. If the total of all unused workers plus a knowledge modifier exceeds 16, one worker, realizing he or she is in a dystopia, runs away. So there’s an interesting balance here of keeping the modifier low and choosing when to retrieve workers and how many to retrieve at a time. Obviously, for efficiency’s sake, you want to retrieve as many workers as possible at a time. But to avoid having them run away (and then embarking on the arduous process of getting new ones), you might make sub-optimal moves. 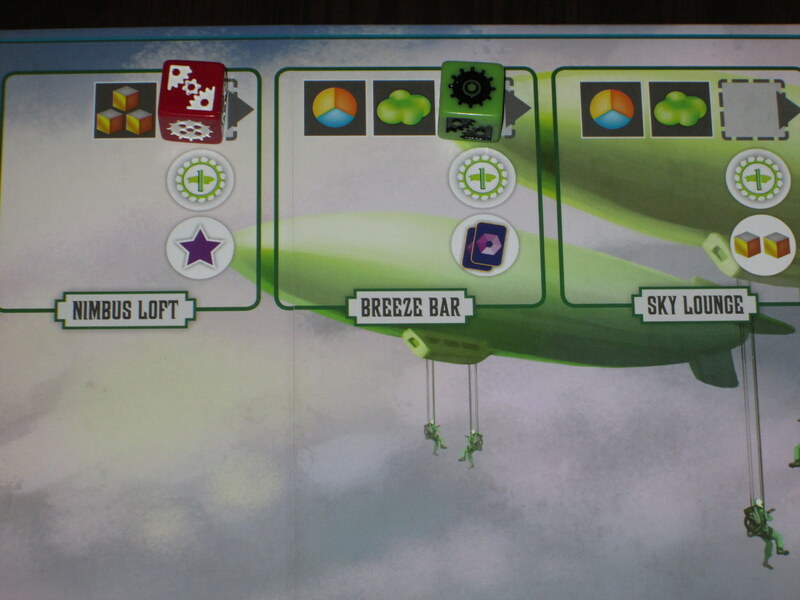 Another interesting side benefit of the dice is the resource areas on the board. The resource areas generate differently depending on what the total of all dice on the resource area is. The more workers are there, the more resources you get–but also the more likely the workers are to realize that they’re pawns in your bid for power. The lower the knowledge total, the more likely you are to advance the faction’s goals. I like the resource areas because they increase opportunities for dice optimization. Built markets allow players to convert a new combination of resources into placed authority. They also inflict a penalty on non-contributing players. Euphoria has a fairly unique market system. At the beginning of the game, six random markets are placed face-down on the board. Depending on the number of players, markets take a certain number of workers and resources to open up. Players will most likely have to work together to build the markets, and once the markets are built, contributing players get to place authority on them. But all players who didn’t contribute suffer an ongoing penalty for not contributing. With six markets in the game, each of which requires a different combination of resources to be built, players must be careful how they allocate their workers. Yet the risk of not contributing is high, so players must always be mindful of what’s being built. I love this concept. I wouldn’t call Euphoria especially thematic, at least in the sense that most big-box Fantasy Flight games are thematic. 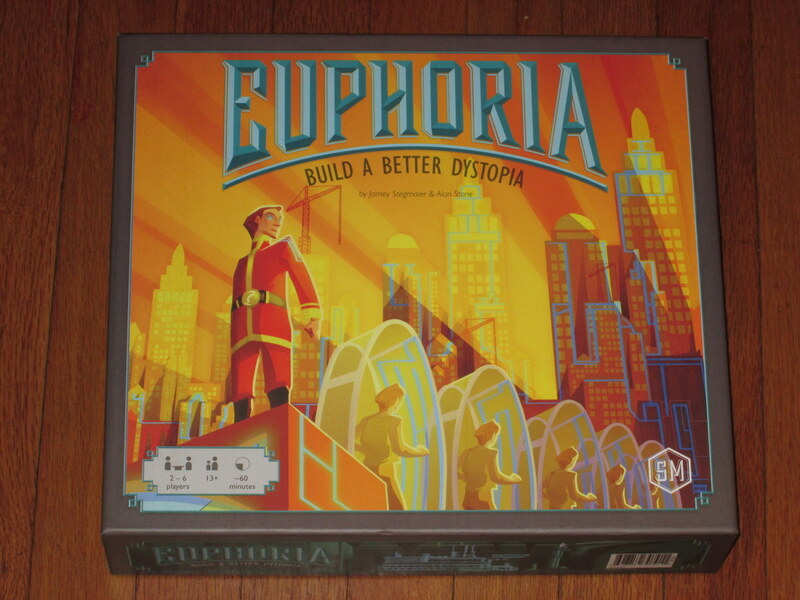 The theme in Euphoria doesn’t (in general) drive home the mechanics of gameplay. (In my recent article on theme, I assigned it to the theme-as-set category.) 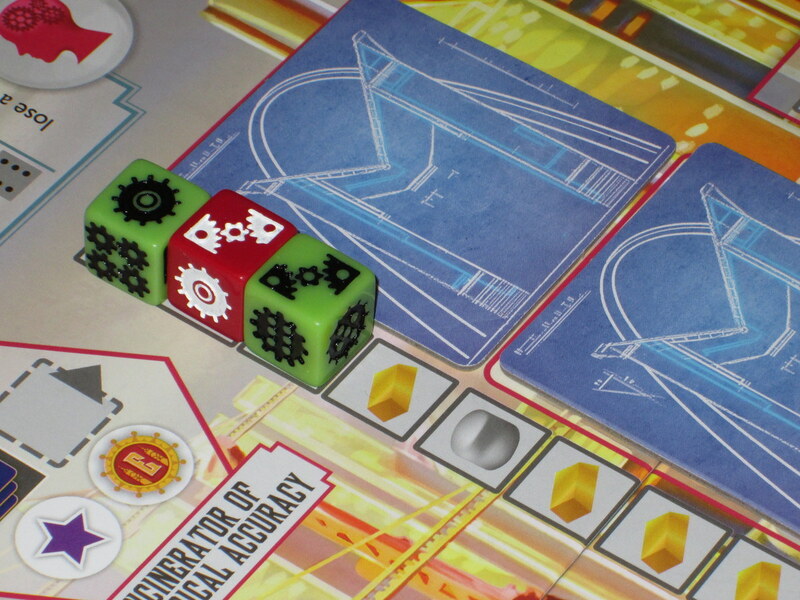 Placing dice around the board to gain resources doesn’t feel like running a dystopia. However, what Euphoria has is atmosphere. The atmosphere in the game is thick, such that if you want to tell a story about the game as you play, you can, but the game doesn’t force this upon you. Euphoria, in this respect, has a great literary quality to it. It feels like there’s a story behind it, even if what you’re doing isn’t a part of the story. I love the atmosphere (especially the names of the markets and recruits), but again, if you’re looking for a full, almost role-playing experience, it’s not in Euphoria’s box. Recruits represent one of the four factions. This gives a consistent bonus for using that faction’s area on the board, as well as a small unique advantage. There are other interesting ideas in Euphoria. 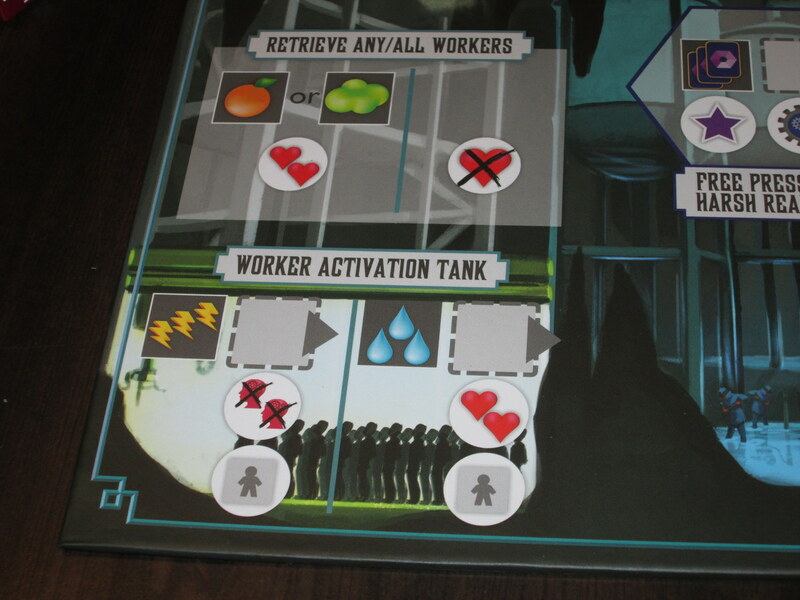 For example, unlike most worker placement games, players take an action to retrieve their workers, so there are no discrete rounds. 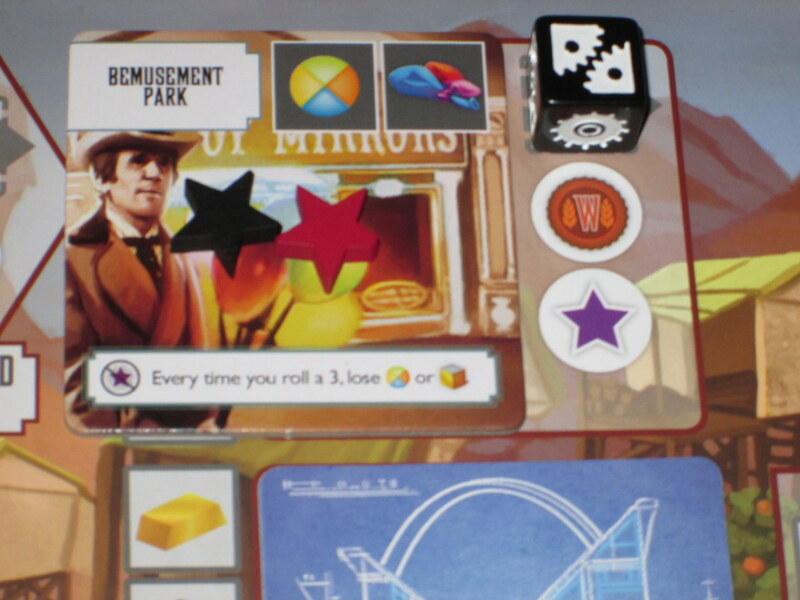 Players may also be bumped from certain spaces on the board, allowing anyone access to a space at the cost of sending another player’s (or their own) worker back to them without an action. (And sometimes sending another player’s worker back is an aggressive ploy to push them over their knowledge threshold, forcing them to lose a worker.) I like the idea of hidden recruits that are revealed in the game when certain conditions are met, and I like the semi-cooperative nature that building markets and advancing factions along their tracks requires. Yet despite all of these positive traits, I said I think Euphoria is decent, not great. What gives? I think Euphoria is simultaneously too forgiving and too punishing for my tastes. These permanent Icarite markets allow players to convert things into other things. I’d call it cube conversion, except here it’s custom wood token conversion. First, Euphoria is too forgiving. One of the first things you notice about Euphoria when you look at the board is, “Wow, this is beautiful!” The second thing you notice is, “Uh, wait. We have to play a game on this?” The board is beautiful, but there is a lot going on. I don’t know if the board could have been arranged much better than it is–it’s functional, once you know what you’re looking at–but it’s overwhelming. 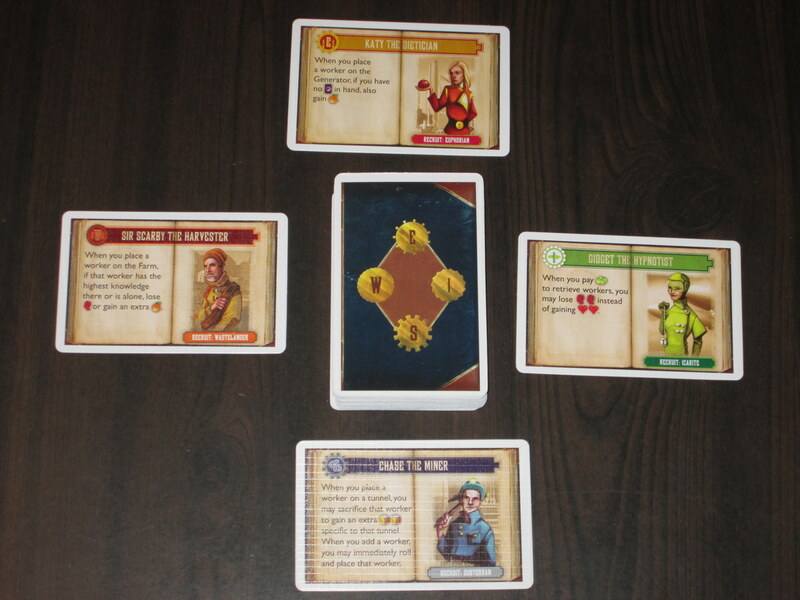 There are four different factions in the game, each represented on different portions of the board. Each faction has an associated commodity used for something in-game, and three have a corresponding resource, used to construct markets. There are allegiance tracks, tunnels, resource areas, market areas, artifact areas, a knowledge track, and a morale track. It’s a lot to take in, and because of all of these areas, it’s a lot to set up. All of these different options have the effect of making the game far too forgiving where it should be tense. One of the mainstays of the worker placement genre is limitation–players are limited in their actions to available spaces, and spaces naturally fill up as the game progresses. The bumping rule changes this up a bit, which isn’t bad in itself (you’re giving another player a benefit, usually, by freeing the space up for yourself), but the openness of the board and the plethora of bumpable spaces means that, in my estimate, there is too little limitation. This is how new workers enter the world. Another aspect of this is that each player begins the game with one active recruit (associated with one faction) and one hidden recruit, activated if certain conditions are met. The active recruit, in addition to giving an ability (usually fairly minor), gives the player controlling that recruit a bonus whenever he or she uses the area of the board associated with that faction. For example, once players advance a faction the first step of the allegiance track, players with recruits from that faction automatically get a bonus commodity when they visit the commodity area for that faction. So far so good–there’s nothing amiss about that. However, the commodities are so similar that there’s really not much separating one commodity from another in usefulness. Sure, there are some things you’ll want to do that you can’t do without a specific commodity, but most tasks in the game can be accomplished by hitting the same lever in the same area, especially if your recruit is Euphorian or Subterran (whose commodities are necessary to get new workers). What this means is that if players have recruits from different factions at the start of the game, there is very little reason for the players to interact with each other. Each faction (with the exception of Icarus) is also tied to a resource, and the way to gain that resource is to trade the faction’s commodity for it. There are different resource requirements to build each market, but there are enough of them on the board that players can pick and choose which ones match their recruit’s strengths since they won’t be able to participate in building them all anyway. What this boils down to is if water is just as good as bliss, and I have a Subterran recruit that gives me an extra water each time I visit the commodity area, why would I bother going to Icarus? I have everything I need under the earth and can be content there. When I do have to venture above ground (I’ve already done everything I can under the ground), there are enough options around the board for me to use my subterran resources elsewhere. This problem is compounded in that the markets appear randomly. I like that eventually players will have done all they can in their faction areas–there are no more free territories to place their stars, for example–and must venture elsewhere. But the markets often require commodities or resources to place authority, and they are not tied to what would be corresponding factions on the board. In one game, for example, my recruit was Subterran, and I was able to get bonuses from the aquifier. 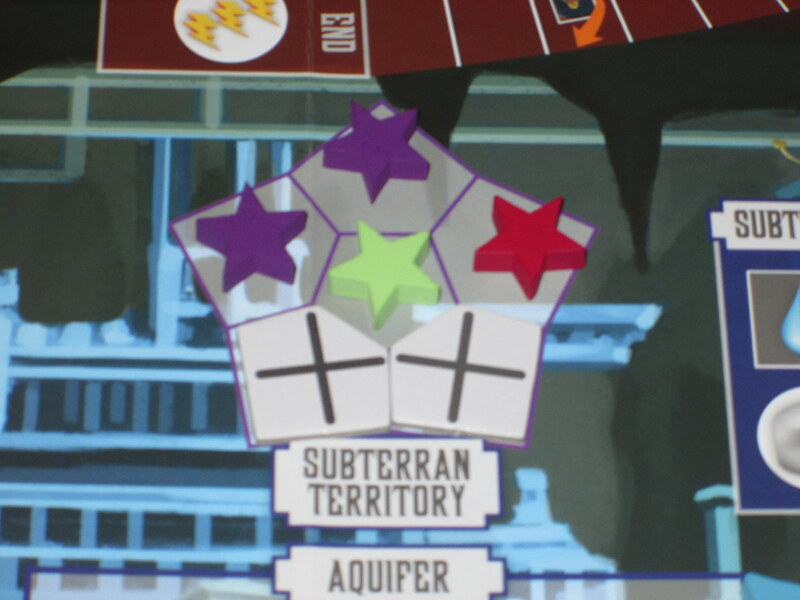 Eventually I had to leave Subterra because its territories were full, but a market opened up elsewhere on the board that allowed me to turn water into authority. Awesome for me, but it also too easily provided a reward for doing the same thing again and again. Of course, the markets also illustrate the brutality of the game. Each market has a penalty attached to it that affects players who don’t build it. I like this idea a lot, except that 1) it’s virtually impossible for players to build all the markets; 2) different market penalties affect different players and strategies differently; 3) the players don’t know which markets will bear which penalties, or, unless the markets are drafted at the start of the game, even which penalties are in the game. Markets enter the game face-down, and they’re only flipped up after being built, so it’s impossible to know whether the penalty is one that will harm you that much to miss out on. Thus whether you’re severely penalized or not is based on pure chance, which is something I don’t appreciate in a game of Euphoria’s length. Similarly, the game is also brutal in how it treats doubles. In Euphoria, you are allowed to place as many dice on your turn as bear the same knowledge–so if you roll doubles or triples (or even quadruples), you can place all those dice on a single turn, saving multiple future turns. This doesn’t seem too imbalanced because probabilities lead us to believe that these should affect all players more or less equally. Furthermore, it gives players one more thing to balance when retrieving dice: lower knowledge modifier means you can retrieve more dice with confidence, lowering the risk of losing workers and increasing the odds that you’ll roll doubles. The problem is that, while probabilities might equal out over time, there’s no guarantee that they will equal out over the small sample of a single game. In one game I played, the player to my left consistently rolled doubles–and even triples! This allowed him to work more efficiently than I could, and it was due to little skill on his part. He was rewarded simply for rolling better. The player to my right was also consistently rolling doubles, but he didn’t help build the market whose penalty is that players get no bonus from rolling multiples. And then there was me–I just didn’t roll that many doubles, despite retrieving enough workers to make rolling doubles feasible. But, you might say, these are dice. What do you expect? The truth is, I expect my choices to matter more in a game that lasts longer than an hour. (The ~60m listed on the box is conservative–more on that in a moment.) I’m not a fan of King of Tokyo, but if I’m playing King of Tokyo and my opponent rolls all claws and knocks me out, fine. The game lasts ~20m, you can reroll your dice; things like this happen. If Troyes (another dice-dependent Euro) had swings of luck like that for its 90-120m playtime, it would be unforgivable. I’m not sure whether this is a consistent issue, but in my experience with Euphoria, far too much rides on the efficiency provided by luck. And no one likes to look back on a game they’ve played and say they couldn’t have modified their behavior to win. Ethical dilemma cards. On the back is a useful player aid. These cards are so cool, but also kind of a missed opportunity. There are a few other niggling things about the game. The morale track with its hand limit seems like a needless limitation and complicator. (Managing it isn’t very interesting, and most of the time it doesn’t matter.) The market penalties you are supposed to suffer are hard to keep track of since there are six markets in the game, many of the penalties tied to “when you roll a specific number.” The ethical dilemma cards all being effectively the same seems like a missed opportunity. All told, I think some aspects of the game could have been streamlined out of it to make it slicker and more manageable. (The Wastelanders seem like a wasted faction, for example, since bliss does what food does, only it has more uses in the Icarite markets.) While it’s cool to have four factions and six markets and two tracks, it’s a lot to manage, and extraneous details only obscure the straightforward resource conversion game underneath. The box estimates the game at ~60m. I’ve found it closer to the 90-minute range after rules explanation. I think you could get it down to 60m with two or three experienced players, but I doubt you could play it in 60m with four or more unless you gave up the thinking inherent in strategy games. I didn’t play with five or six players, but with four players, the game outlasted my interest at 90m, so I don’t think I’d play with more, even though I bet that would open the board and create more competition for spaces. I think a competitive, knowledgeable four-player group who could play quickly is probably the ideal count for this game. All the market tiles in the game. I love the names of these, and they also highlight the gorgeous artwork in the game. As I mentioned at the start of this review, I was prepared to love Euphoria. It’s not a bad game, but it’s not a great one either. For a game that lasts over an hour, the decisions either aren’t compelling enough (the case of the too-open board and too-balanced resources) or are inconsequential (market-building and doubles rolling). There are some fascinating concepts in this game that I would love to see explored in a different, more limited (and controlled) context. 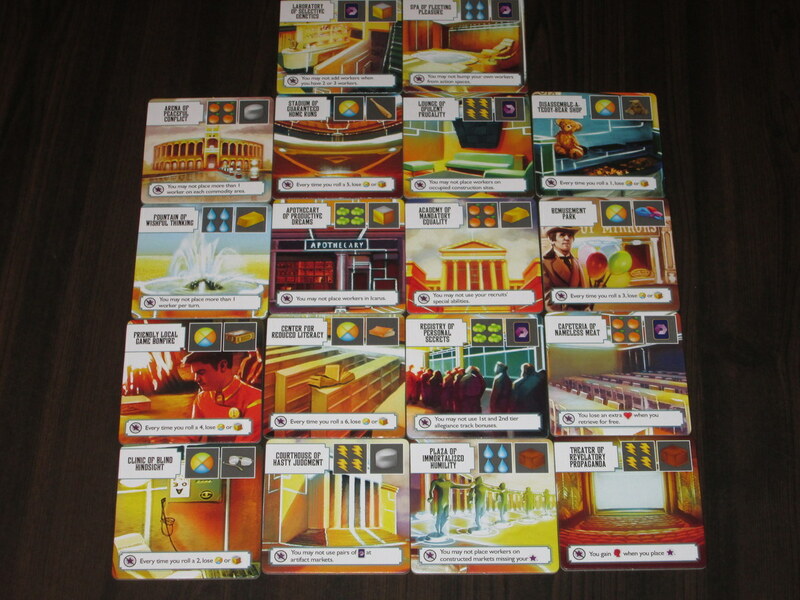 The artwork and components are fantastic, but they belie the fairly straightforward game. Some people will love Euphoria. Players who don’t like “themeless” Euro games will gravitate toward it (and I don’t blame them–the components!). 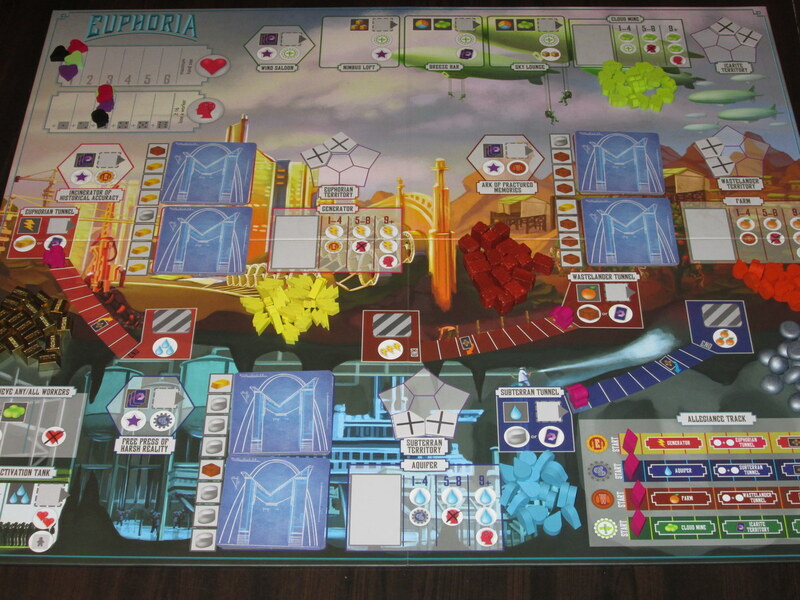 One player even mentioned that Euphoria might be his favorite worker placement game. And judging by the glowing reviews on BGG and elsewhere, my opinion is in the minority. Yet I feel the same way about Euphoria as I do about Lords of Waterdeep: the emphasis on atmosphere makes for a less interesting game. I don’t often have gaming time that comes in longer than 60-minute chunks. For that reason, I don’t see myself playing Euphoria too much in the future. There’s no insert, but boy is there a lot of stuff jam-packed into this box. All of this to say, if you judge games based on components, expect to get your money’s worth. Previous ArticleNews Bits: Extra, Extra! Great review! I especially appreciate that you spent less time on the rules and more time on what works and doesn’t. Looks like I’m in the minority, too: I agreed with all of your points, as well as wishing it had been a better game than it is. The first game we played I actually missed the rule about doubles allowing multiple placements. It made the game a little longer, but not much different. Perhaps you could try ignoring it in your next session to mitigate the luck. As I played, I was tinkering with a few variants to reduce the luck and increase competition. If those two issues could be solved, I would be a happy camper, because truly, Euphoria is an excellent production. Also, did you see the variant Jamey listed below? That seems like it might solve two problems at once. The one other variant we’re consider (recently mentioned to me on BGG by Mike Arms, I believe) is the idea of letting players peek at the market tiles of their starting recruit’s faction. So if I have a Wastelander recruit face-up at the beginning of the game, I could peek at both Wastelander market tiles. to have some information. Icarites could pick any two tiles to look at. I might get a chance to try it tonight–I thought it was a clever idea that respected the original intent of the face-down tiles (mitigating information overload and adding an element of surprise) but reduced the amount of randomness a little bit. Thanks for the thorough review! I think your criticisms are very fair, and you all know how much I respect your opinion. A few months ago, someone on BGG mentioned a variant that we hadn’t considered, and at this point I think it’s the only variant not in the rulebook that we officially endorse (there is one other one I’m considering). The variant says that if you have multiple available workers with the same knowledge, you can place one of them as normal, but if you want to place the other one on the same turn (the doubles rule), you have to lose 1 morale to place it. It makes morale more relevant and adds a cost to the luck factor. Thanks for your gracious reply! The morale variant is interesting. It really might kill two birds with one stone in reducing the advantage of rolling doubles and in making the morale track more valuable. I’ll have to give it a try. I too look forward to trying some of these variants. 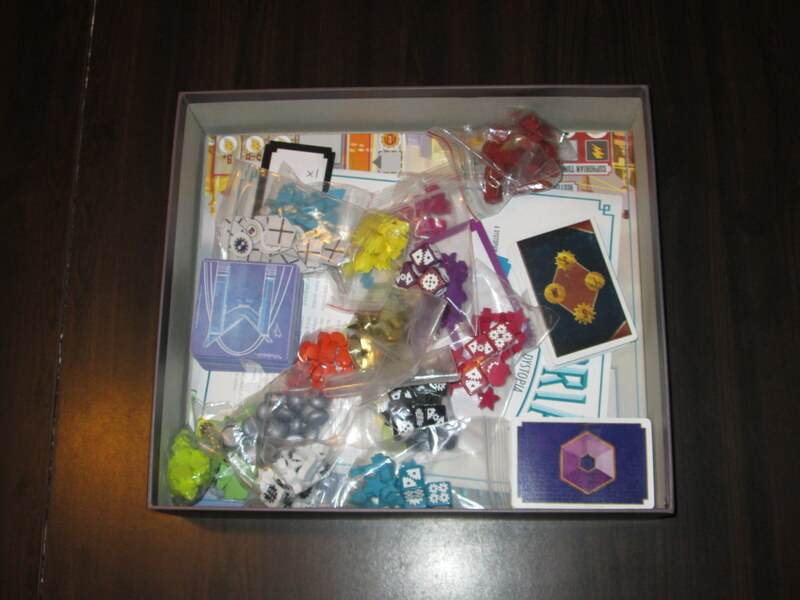 I backed the game and it is *pretty* good, but the great thing about board games over video games or other forms of entertainment, is that you can change up the rules. I forget that!